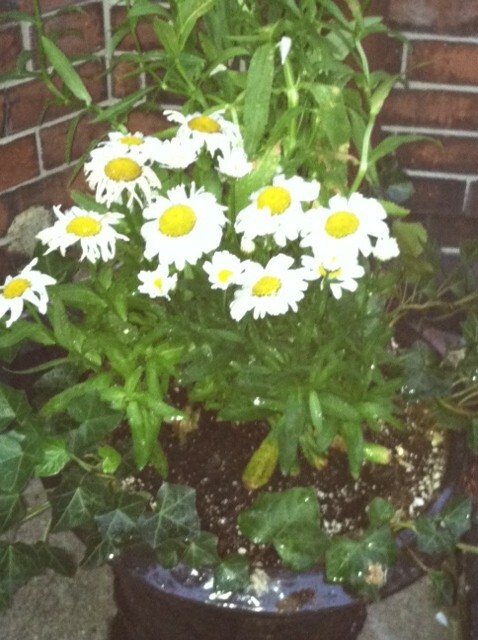 The Back Bay flower thief has struck again! Last year, three gorgeous dahlias were plucked from our street-side tree garden. 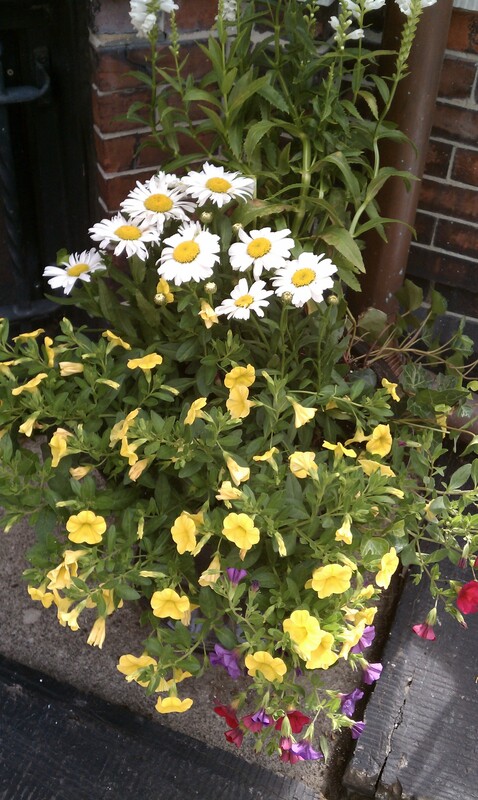 This past Friday night, an entire clump of yellow petunias was lifted straight out of our side-street container. My husband is threatening to install a close-circuit camera! I must admit this post does sound a bit like the game of Clue…. “He was in the alley with the dahlias from the garden!” Wish it was all just a game. In the larger scheme of things, flower theft is small potatoes. We made a quick trip to Mahoney’s in Brighton to find replacements. There I learned that flower theft was on the rise all over the city! The young man at the register told me that I was the 11th or 12th person to come to the Garden Center over the past several days with the same lament. Misery loves company. And yellow petunias? Very hard to find, just in case you were interested. 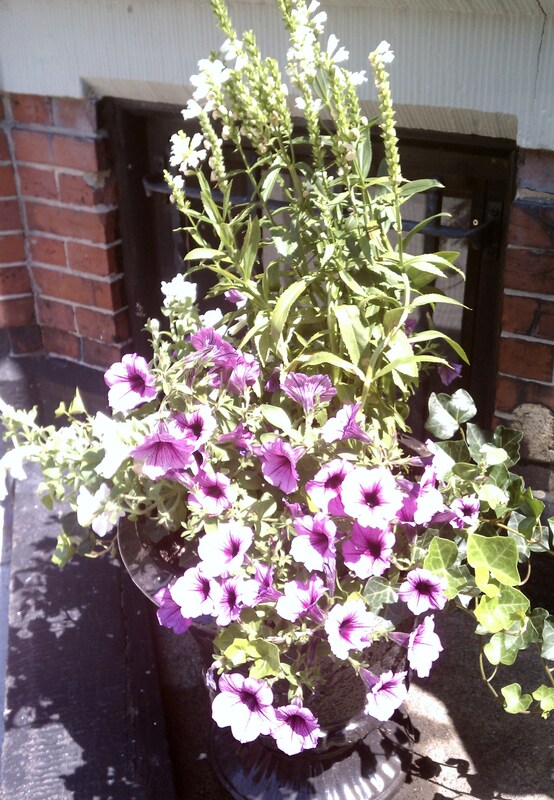 Luckily, there were plenty of healthy and hearty Proven Winner purple and white petunias for sale. Did some serious rearranging in all my containers. Kept the tall, white “Crystal Peak White” False Dragonhead Physostegia (sometimes called Obediant Plant), removed the Shasta daisies and nestled the new petunias with the existing English ivy. All the plants seems happy in their warm, sunny space. Fingers are crossed that the flower thief has retired for the season. Here’s wishing that your flowers are blooming and staying where you planted them! Enjoy! This entry was posted in Buying Flowers and Plants, Container Gardens, Expert Advice, Flowers and Plants, My street-side tree garden, Recommendations, Sunlight and tagged Choosing Plants, container gardens, Expert Advice, False Dragonhead Physostegia, Favorite Flowers, Favorite Garden Flowers, Flower Thievery, Mahoney's Garden Center, Petunias, Proven Winners, Small space gardening. Bookmark the permalink. So sorry to hear that someone would steal your beautiful flowers. I’m glad to hear that you found some replacement flowers. Some people can be so inconsiderate.